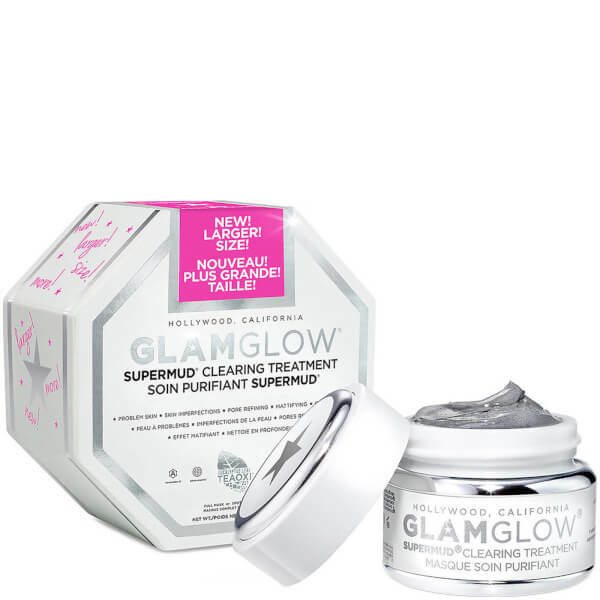 Combat common skin concerns with the GLAMGLOW Supermud Mask; an innovative, unisex facial treatment that tackles blemishes and breakouts, whilst visibly tightening skin’s texture and pores. Perfect for use as a full facial mask or as a one spot solution for blemished areas, the mask works to absorb skin’s impurities, without affecting any natural oils. Enriched with a skin-loving blend of ingredients including Glycolic, Salicylic and Lactic Acids, the effective mask works to heal damaged skin and smooth pigmentation, whilst deeply nourishing the complexion. The mud mask is also able to encourage collagen synthesis at the visage, which results in a youthful appearance and radiant, soft skin. Leaving skin feeling refreshed and cleansed, the treatment offers noticeable results after just one use. Expect a visibly healthy visage that is calm, clear and comfortable. Apply a Thin Layer to Clean Skin. Leave on for 5 - 20 minutes & Remove with Water. Use as a Full Face Mask or Spot Treatment as often as needed. Avoid eye area. Use a sunscreen and limit sun exposure while using the week after. Not for use on sensitive skin. Water\Aqua\Eau, Kaolin, Magnesium Aluminum Silicate, Mandelic Acid, Carbon, Eucalyptus Globulus Leaf, Tartaric Acid, Pyruvic Acid, Lactic Acid, Salicylic Acid, Glycolic Acid, Eucalyptus Globulus Leaf Powder, Aloe Barbadensis Leaf Juice, Glycyrrhiza Glabra (Licorice) Root Extract, Cucumis Sativus (Cucumber) Fruit Extract, Hedera Helix (Ivy) Extract, Symphytum Officinale (Comfrey) Leaf Extract, Chamomilla Recutita (Matricaria) Extract, Peg-12 Dimethicone, Caprylyl Glycol, Sodium Hydroxide, Butylene Glycol, Mentha Piperita (Peppermint) Oil, Hectorite, Hexylene Glycol, Glycerin, Calendula Officinalis Extract, Maltodextrin, Ethylhexylglycerin, Xanthan Gum, Fragrance (Parfum), Limonene, Benzyl Benzoate, Linalool, Phenoxyethanol, Potassium Sorbate, Sodium Benzoate, Iron Oxides (Ci 77499). Please be aware that ingredient lists may change or vary from time to time. Please refer to the ingredient list on the product package you receive for the most up to date list of ingredients.